A recent issue that surfaced on the selenium-users mailing list was related to running Selenium in "Driven Mode" (soon to be dubbed Remote Control or RC mode) by using the Twisted-based Selenium server on Linux. Normand Savard had followed my initial instructions, but was getting CGI "premature end of script" errors. I tried to follow my own instructions using the latest Selenium code and I got the same error. I managed to get it to work, so I'm posting the steps I went through to solve it. My setup was a Linux box running Ubuntu Breezy with Python 2.4.2. 1. Download and install Twisted version 1.3 (this is important, because things have been known not to work so well with Twisted 2.x). Old versions of Twisted, including 1.3, can be downloaded from here. Now edit nph-proxy.cgi and replace the path to perl in the first line from the Windows-specific path that's in there by default, to the real path to perl on your Linux box (in my case it was /usr/bin/perl). You should see the Selenium Functional Test Runner page at this point. You can then close the browser. At this point, a Firefox window will be automatically opened, the browser will connect to the SeleneseRunner.html page and will execute the test commands specified in the google-test-xmlrpc.py script. You should see the bottom frame of the SeleneseRunner.html page open the Google home page, then enter a search phrase and run the search. That's it. You're now the proud owner of a Driven Selenium installation. 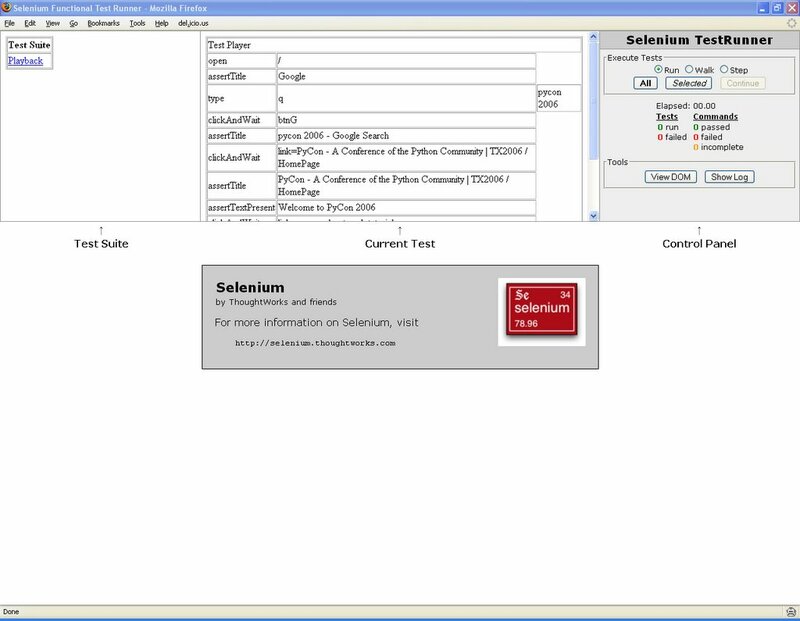 For instructions on running the Selenium Twisted server on Windows, see this post. For resolutions of other various issues that people were faced with, see this other post. Darren Hobbs talks about "Why a 20 minute build is 18 minutes too long". The build in question included acceptance tests. His conclusion is that I/O is the enemy. My take on it is that a continuous build system should run all the unit tests, plus a subset of acceptance tests that are known to run fast. The other acceptance tests, especially the ones that do a lot of I/O, can be run more leisurely, once every X hours. Michael Hunter, aka The Braidy Tester, posts his impressions on Uncle Bob's SDWest talk on Agility and Architecture. I particularly enjoyed this point: "The first, most important part of making code flexible is to surround it with tests." Tim Ottinger (from ButUncleBob's crew) blogs on his experience with Testing Hypothetically. It's all about seeing the big picture when writing acceptance tests, and not being bogged down in the implementation-specific details that are best left to the realm of unit testing. Brian Marick tells us to pay attention when finishing a story. Is the system better off (more malleability is what Brian is looking for) now that the story is done? Roy Osherove posted the first article in what I hope is a long series on "Achieving and recognizing testable software designs". He discusses a problem that I also raised in the Agile Testing tutorial at PyCon: writing good unit tests is hard. But thinking about making your system testable will go a long way toward increasing the quality of your system. And Roy proceeds with practical recipes on how to achieve this goal. Great article. While I'm mentioning unit testing articles, here's another good one from Noel Llopis's Games from Within blog: "Making better games with TDD". I haven't seen too many articles on developing games in a TDD manner, and this one really stands out. I particularly enjoyed their discussion of when and when not to use mock objects. A lot of lessons learned in there, a lot of food for thought. Finally (for now), via Keith Ray, here are Agile Development Conversations in the form of podcasts. I'm thinking about periodically posting stuff like this. Of course, I could just post my del.icio.us bookmarks, but going through the articles and commenting on them a bit helps me in committing the highlights to memory. An often-asked question on the selenium-users mailing list is how to test Ajax-specific functionality with Selenium. The problem with Ajax testing is that the HTML page under test is modified asynchronously, so a plain Selenium assert or verify command might very well fail because the element being tested has not been created yet by the Ajax call. A quick-and-dirty solution is to put a pause command before the assert, but this is error-prone, since the pause might be not sufficient on a slow machine, while being unnecessarily slow on a faster one. A better solution is to use Dan Fabulich's waitForCondition extension. But first, a word about Selenium extensions. If you've never installed a Selenium extension, it's actually pretty easy. You should have a file called user-extensions.js.sample in the same directory where you installed the other core Selenium files (such as TestRunner.html and selenium-api.js). You need to rename that file as user-extensions.js, so that it will be automatically picked up by Selenium the next time you run a test. To install a specific extension such as waitForCondition, you need to download and unpack the extension's zip file, then add the contents of the user-extensions.js.waitForCondition file to user-extensions.js. That's all there is to it. Now back to testing Ajax functionality. For the MailOnnaStick application, Titus and I used Ian Bicking's Commentary application as an example of Ajax-specific functionality that we wanted to test with Selenium. See this post of mine for details on how Commentary works and how we wrote our initial tests. The approach we took initially was the one I mentioned in the beginning, namely putting pause commands before the Ajax-specific asserts. Interestingly enough, this was the only Selenium test that was breaking consistently in our buildbot setup, precisely because of speed differences between the machines that were running buildbot. So I rewrote the tests using waitForCondition. What I'm doing here is asserting that a certain HTML element is present in the page under test. For the Commentary functionality, the element I chose is the text area of the form that pops up when you double-click on the page. This element did not exist before the double-click event, so by asserting that its value is empty, I make sure that it exists, which means that the asynchronous Ajax call has completed. If the element is not there after the timeout has expired (10 seconds in my case), the assertion is marked as failed. This function gets a locator as its only argument. In the example above, I used the XPath-style locator "//textarea[@name='comment']" -- which means "give me the HTML element identified by the tag textarea, and whose attribute name has the value 'comment'". The value of this HTML element is empty, so this is exactly what I'm asserting in the test table: value == "". You might wonder how I figured out which element to use in the assertion. Easy: I inspected the HTML source of the page under test before and after I double-clicked on the page, and I identified an element which was present only after the double-click event. 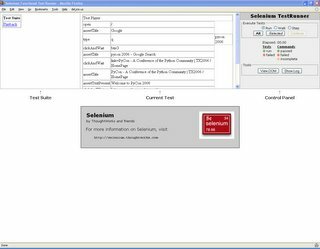 For more details on how to identify HTML elements that you want to test using Selenium test tables, see this post on useful Selenium tools, and this post on using the Selenium IDE. Elizabeth Hendrickson on "Better testing, worse testing"
That's pretty much what Elisabeth says in her post, with war stories that prove her point. I particularly liked the following "lesson learned" -- and I quote: "This leads me to my next general conclusion: an isolated improvement in one aspect of a development process tends to be offset by declines in another, resulting in no overall improvement in the final result. So how do we improve results? By paying attention to the whole process and not just isolated aspects of it." Make it as easy as humanly possible to run all these types of tests automatically, or they will not get run. 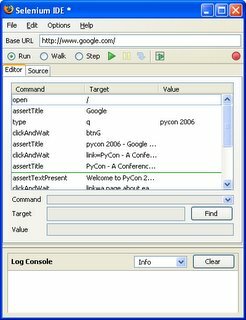 pywinauto (added by its author Mark McMahon): "Simple Windows (NT/2K/XP) GUI automation with Python. There are tests included for Localization testing but there is no limitation to this. Most of the code at the moment is for recovering information from Windows windows and performing actions on those controls. The idea is to have high level methods for standard controls rather then rely on Sending keystrokes to the applications." svnmock (added by its author Collin Winter): "enables easier testing of Python programs that make use of Subversion's Python bindings." testosterone (added by its author Chad Whitacre): "an interface for running tests written with the Python standard library's unittest module. It delivers summary and detail reports on TestCases discovered in module-space, via both a command-line and a curses interface. The interactive mode is the default, but it depends on the non-interactive mode. For debugging, static tracebacks and interactive Python debugger (Pdb) sessions are available in both scripted and interactive modes." Bitten (added by Matt Good, written by Christopher Lenz): "a Python-based framework for collecting various software metrics via continuous integration. It builds on Trac to provide an integrated web-based user interface." pyMetrics (added by Mark Garboden, written by Reginald B. Charney): "produces metrics for Python programs. Metrics include McCabe's Cyclomatic Complexity metric, LoC, %Comments, etc. Users can also define their own metrics using data from PyMetrics. PyMetrics outputs SQL command files and CSV output." readable HTML documents showing sortable summary and annotated source files." pyAA (added by myself, written by the Carolina Computer Assistive Technology group at UNC-Chapel Hill): "an object oriented Python wrapper around the client-side functionality in the Microsoft Active Accessibility (MSAA) library. MSAA is a library for the Windows platform that allows client applications inspect, control, and monitor events and controls in graphical user interfaces (GUIs) and server applications to expose runtime information about their user interfaces. 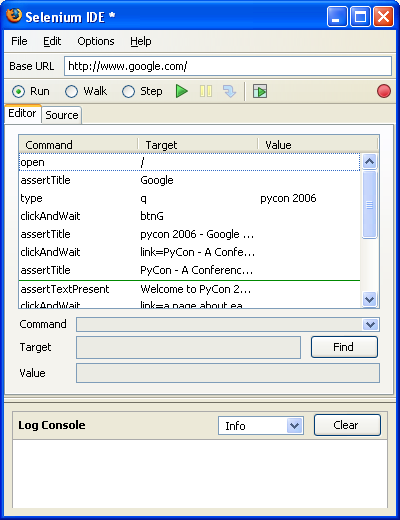 See Peter Parente's User interface automation with pyAA tutorial for more info." The last few days I've interviewed some candidates for an entry-level QA position at the company where I work . All of them were fresh graduates of local universities, some from the University of California system, some from the Cal State system. All of them had something in common though: they very seriously explained to me how they took classes in "Software Development Lifecycle" and how they worked on toy projects, first obtaining requirements, then designing, then implementing, then at the very end, if they had time, doing some manual testing. Of course, no word of automated testing, iterations, or other agile concepts. At least they used source control (CVS). One guy in particular told me kind of proudly that he knows all about the Waterfall methodology. He said they spent a lot of time writing design documents, and since they *only* had one semester for the whole project, they almost didn't get to code at all. I couldn't help laughing at that point, and I told him that maybe that should have been a red flag concerning the validity of the Waterfall methodology. I couldn't have found a better counter-example to Waterfall myself if I tried. Almost no code at all to show at the end of the semester, but they razed half of a forest with their so-called documentation! Of course, I tried to gently push them on the path to enlightenment, briefly explaining that there are other ways to approach software development and testing. One can always try at least, right? It amazes me though how out of touch many schools are with the realities of software development. If I were in charge of the CS program at a university, I'd make it a requisite for all students to work through Greg Wilson's Software Carpentry lectures at the University of Toronto. I particularly like the lectures on The Development Process and Teamware. Unfortunately, stuff like this seems to be the exception rather than the norm. Titus just put the finishing touches on a very fast-paced and entertaining Buildbot Technology Narrative page on the Agile Testing wiki we used for our PyCon tutorial. Highly recommended if you're curious to see how a continuous integration tool such as buildbot can be used to...well, to integrate all the types of automated tests that we used in our tutorial. Comments/suggestions appreciated. Please leave them here or send them via email to titus at caltech.edu or grig at gheorghiu.net. 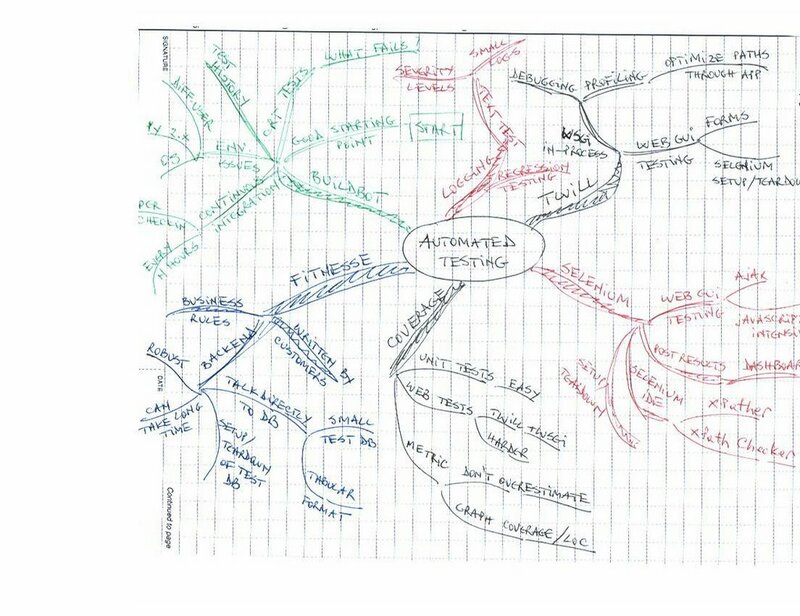 I first encountered the concept of mind maps when I read the 1st edition of "Extreme programming explained" by Kent Beck. I've wanted for a long time to delve more into this subject, but it's only now that I got around to it by reading "Mind maps at work" by Tony Buzan, the inventor of mind maps. One thing that Tony Buzan recommends, and that I found very helpful, is to use different colors for the different branches of the mind map. This is because one of the main strengths, if not the main strength of mind maps, is to engage both sides of your brain -- and using color helps exercising the often neglected right side. The usual method of describing a concept by using linear lists and slides with bullet points is much more analytical, and tends to engage only the left side of the brain. 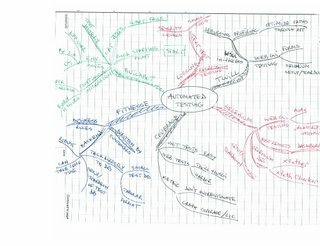 I'm pretty excited about mind maps and I plan on using them intensively on my projects. Highly recommended! The good news is that if you're using Firefox, you're in luck -- you can pretty much bypass this limitation thanks to the wonderful Firefox extension called Selenium IDE (used to be called Selenium Recorder.) I talked about the Selenium Recorder and other useful Firefox extensions in a previous post. What I want to show here is how easy it is to write Selenium tests, even against 3rd party applications, by using Selenium IDE. I'll assume you already installed Selenium IDE. You need to launch it via the Firefox Tools menu. It will open a new Firefox window that you just leave running in the background. Now you have several options for replaying and saving the current test. You can click on the large green arrow button. This will replay the actions in a Firefox window and will color the Selenium IDE assertion rows green or red, depending on the result of the actions. At this point, you can run the test in the standard TestRunner mode, by clicking for example on the Run button in the TestRunner Control Panel. At this point, you can also save the test by choosing File->Save Test or pressing Ctrl-S in the Selenium IDE. The test will be saved as an HTML file. An important note: all this Selenium IDE hocus-pocus does lock you in on Firefox. As soon as you start testing pages that are not under your application root, or you start mixing http and https in your tests, you will not be able to run the same tests under IE, Camino, Safari or other browsers -- at least not until people come up with browser-specific extensions that will get around the XSS limitation. If you want your tests to be portable across browsers, you can still use Selenium IDE to create the tests. You just need to make sure you test pages that are within your application, and that use the same protocol throughout the test. After saving the tests as local HTML files, you need to copy them over to the Selenium installation that you have deployed on the server hosting the application under test. In any case, I urge you to start using Selenium IDE. It will give you a major productivity boost in writing Selenium tests. There are other features of the IDE that I haven't covered here (after all, it's meant to be an IDE, and not only a playback/capture tool), but for this I'll let you read the online documentation or, even better, watch the movie. I would say that since you're doing *acceptance* testing, it doesn't make too much sense to mock the database. Mocking makes more sense in a unit testing situation. But for acceptance testing, the way I see it is to mimic the customer environment as much as possible, and that involves setting up a test database which is as similar as possible to the production database. Of course, if you have a huge production database, it is not optimal to have the same sized test database, so what I'd do is extract datasets with certain characteristics from the production db and populate the test db with them. I'd choose corner cases, etc. A couple of other people replied to the initial post and said they think that "pure business rules" should also be exercised by mocking the backend and testing the application against data that can come from any source. While I think that this is a good idea, I see its benefit mainly in an overall improvement of the code. If you think about testing the business rules independent of the actual backend, you will have to refactor your code so that you encapsulate the backend-specific functionality as tightly as possible. This results in better code which is more robust and more testable. However, this is a developer-facing issue, not necessarily a customer-facing one. The customers don't necessarily care, as far as their acceptance tests are concerned, how you organize your code. They care that the application does what they want it to do. In this case, "end-to-end" testing that involves a real database is I think necessary. In this context, Janniche Haugen pointed me to a great article written by David Chelimsky: Fostering Credibility In Customer Tests. David talks about the confusion experienced by customers when they don't know exactly what the tests do, especially when there's a non-obvious configuration option which can switch from a "real database" test to a "fake in-memory database" test. Maybe what's needed in this case is to label the tests in big bold letters on the FitNesse wiki pages: "END TO END TESTS AGAINST A LIVE DATABASE" vs. "PURE BUSINESS LOGIC TESTS AGAINST MOCK OBJECTS". At least everybody would be on the same (wiki) page. My conclusion is that for optimal results, you need to do both kinds of testing: at the pure business rule level and at the end-to-end level. The first type of tests will improve your code, while the second one will keep your customers happy. For customer-specific Fit/FitNesse acceptance tests I would concentrate on the end-to-end tests.